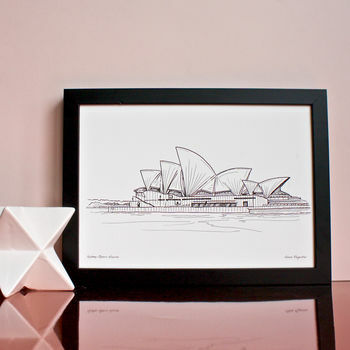 A print based on an original pen and ink illustration of Sydney Opera House. It is printed on A4 ( 21 x 29.7 cms ) medium weight lightly textured art paper and will arrive packed in a clear plastic sleeve with a backing board and logo sheet. It's delivered in an A4 board envelope so that it arrives to you in perfect condition. Medium weight lightly textured art card and ink.